-how the stories we and others tell about us influence our world. It is important both for the person telling the story, and the one listening to it, to be able to come together for the healing of the story, and the changing of it so we become the Hero of ours, not the extra- small bit part. So often people who hear voices will not share their stories, or that of their voices, yet it is important to find the meaning to them, and from there transform it. 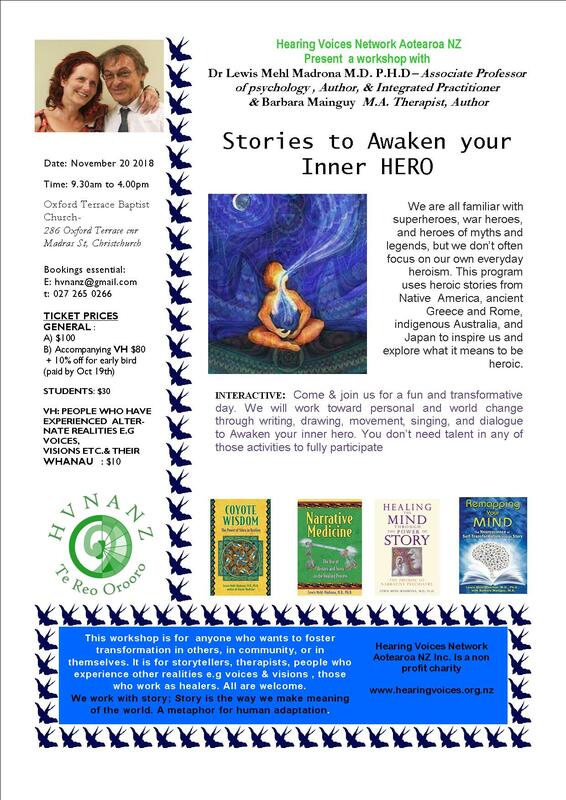 Lewis has written some fabulous books, and combined wit the indigenous wisdom of the Native American and his professional medical background can offer a safe and transformative way to deal with psychosis, either as a medical professional or as a person with these experiences themselves. Take this opportunity to see the stories in a way that can help to transform. Speaking the language of story, to find a common ground where we need to be to have an effective relationship with ourselves, the voices and where applicable for your clients. Some professionals have asked me after a hearing voices group- " how come they talk when they come here? They don't talk at all at the house?" Often it is about how you listen, how your respond, how you see the story and its links. Story telling, active listening is a skill we can all use in our lives. You can book online at EVENTFINDA- see links listed below for Christchurch, Auckland or Wellington. If you need an invoice and to do direct credit, I have attached registration forms ( which are cheaper to do) Please share to whoever may need a boost to move forward. 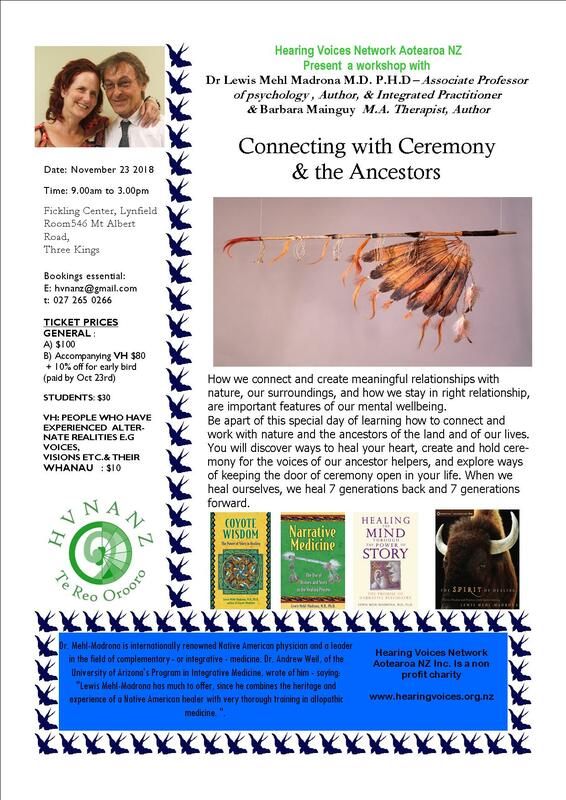 The last workshop in Auckland is Connecting with ceremony. We think that we are separate beings from our family, our environment, from the earth, from nature. Yet everything is inter connected. Many indigenous cultures agree that if we are sick or unwell that we have lost our connections, or our connections have become weakened in an area. Voices and visions are often metaphorical and mystical by nature, If we try to deal with them with clinical and medical terms, sometimes it can be too far apart from what a person is experiencing, as our experiences are so profound, for us to bridge the gap, and we fall into it. The framework of madness is difficult to hang on to when you fall. The spirituality part of our experiences can often be ignored. Talk of spirit and soul dismissed as delusions and pushed away- leaving the person either confused, or deciding to hide their experiences. Ceremony is a way to regain healthy connections, to perform a ritual is the perfect way to start transformation for those of us who are stuck as the metaphor of their experience has not been understood or has left them with no way to move forward. Ceremony allows us to call on those energies and powers we need to shift the inner worlds and landscapes we may visit in a meaningful way. Which is why indigenous cultures such as the Native American and the Maori use them. The energy can shift, allowing healing to come in. Ceremony can be a simple way to connect with each other and create a space where we allow the idea that change is possible without judgement.